You are a business owner looking at reports from your SEO vendor and they show you a list of 100 keywords that you rank #1 for. You feel good! This article will explain how keyword volume and rank reported throughout the SEO industry is misleading because it is based on a source (Google) that is assumed to be respectable and accurate. Well, we can prove it is not accurate anyway. You want to know that your SEO vendor isn’t selling you a feel-good story. Lets face it, most of those fancy reports don’t tell you anything actionable anyway – they are just pretty and somehow leave you with a warm and fuzzy feeling. But business decisions should not be based on “fuzzy feelings”. So lets cut through the crap. The truth is, those reports are just telling you what you want to hear, showing you what you want to see. Most Search Rank Reports highlight Zero Volume keywords that make you look good, 0 volume means noone uses those. The fact is, if we are going to do any Internet Marketing at all, blog more (build more content) and get more backlinks; we still want to know which keywords work and which don’t. OK. How do we find which keywords we should use? Step #1 – What does Google say about our current exposure? On the far right is the first level on our way to Keyword Enlightenment; our Average Position. Now think! if our website is getting an Average Position of 1st place for this keyword, shouldn’t our website be seen EACH time someone SEARCHed using that keyword? So lets verify the Search Volume for our keywords using Google Adwords Keyword Planner. 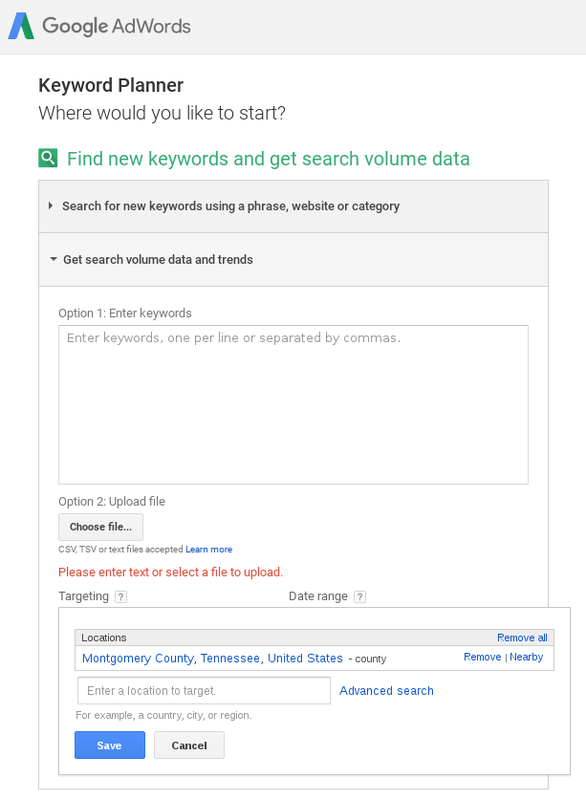 Step #2 in Keyword Planner we must narrow our view to a Geo ( otherwise Google will give us global volume instead and we are not interested in what happens more than 100 miles away from our business ). We copy and paste our keywords from Search Console > Queries into Keyword Planner, we download our results, sort in a spreadsheet, correlate the two sets of data (the tedious part and why good SEO work is so time consuming – and because Google is not really trying to help ) and we get an interesting juxtaposition. Why is Google telling us there are 390 searches (Search Volume) for a keyword that our website got the #1 spot for yet was seen only 83 times? That does not make sense. That is a 470% inflated “estimate”. Why does Google report two different results for what is essentially the same thing? I’m inclined to believe that Keyword Planner is a feel-good tool. And that is why I think it is useless for doing any keyword research. I could extrapolate further whether anything Google reports is accurate, including the clicks a website “supposedly” gets in analytics. This all means that SEO vendors using Google data for their prettier reports (which is almost everyone) are even more useless. BTW, this is why we built SearchStation. At least with SearchStation we get accurate search rank (which means Impressions in both Organic and Paid results). I would suggest employing a 3rd Party Analytics tool to track clicks as the other reporting we would need to get some realism back into our keyword research and SEO reporting. We can now cut the crap and conclude that the only way to To Do Keyword Analysis For Local Search Engine Optimization is to derive it locally from actual SEARCH RANK and TRAFFIC that actually hits your website. Having reached our goal of Keyword Enlightenment we know that Google’s Analytics and most SEO Vendor Reports are feel-good reporting and not the real world. We also now know that if our website consistently ranks #1 for a keyword, then visitors reported in our analytics is the most accurate measure of Search Volume for that Keyword. Coming soon, in Part II of this series, we will take a look at the accuracy of Search Rank Reporting in Google Search Console.